When committed in the name of revenge, even the vilest deeds may seem forgivable. Bond had certainly not forgiven the Algerian. For weeks he had been lying sleepless, night after night, envisioning in detail how he would slowly kill this man. He’d rehearsed in is mind’s eye every gory and painful detail of his revenge on the man who exploited Vesper to betray him so deeply. He would inflict as much physical pain as he could conjure on the man who manipulated Vesper to use Bond’s love for her deceive him, and to ultimately kill herself for it. Then came the moment Bond thought he had been living for. The chance to exact his revenge on the man who, for being alive, had been haunting Bond’s thoughts. Bond had his P99 pointed between the man’s dark eyes, seeing the anticipation of death on the man’s face as clearly as he saw the tiny bids of cold sweat that formed on his forehead. Bond squeezed the trigger slowly, agonizingly slowly, then found himself releasing it without firing. He had let the man live. As a professional it was the right choice, since the Algerian was a major source of information on the Quantum organization, but as a human being, albeit an emotionally cold one who had been meticulously trained to become a “blunt instrument” of her Majesty’s secret service, Bond still felt a deep emptiness inside. He interpreted it as the need for revenge, though the MI6 Psychiatrist insisted was the need for “closure.” Neither seemed within grasp, so the best Bond could manage was distraction. This morning the distraction came in the form of the delightful sounds of his Aston Martin’s engine. 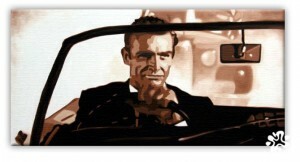 Bond tightened his grip on the steering wheel, dropped a gear and took off a straight stretch of country road. The car, a quite rare 1963 DB5 he had won in a poker game, was the closest thing to a “hobby” for him. On this Sunday morning he had taken her out for a drive outside London, hoping that the combination of engine sounds and the adrenaline of pushing the car to its limits will drown out his thoughts about Vesper. He found it helped ease the pain, though only partially, much like the double-Bourbons or amorous encounters did. Rounding a hairpin curve at 100 Km/h he told himself, for the hundredth time, that he needed to get Vesper out of his head (or is it his heart) permanently if he is to fully function again. “Well, 007, this should certainly help” Bond said to himself, having spotted a disabled Porsche at the side of the road, convertible top down and a strikingly beautiful young woman behind the wheel. He pulled over slowly in front of the Porsche, glided out of his DB5 and made his way to the driver. His mood was beginning to change as his lips began to form his easy smile. Perhaps his most dangerous weapon. “Well good morning Miss” his eyes were now smiling too. “Certainly, I…” Bond froze mid sentence, his eyes fixating on the necklace around her long, delicate neck. The woman was wearing an Algerian love knot! “What’s the matter?” she asked as her hand reached instinctively and her fingers wrapped around her necklace. “That’s an interesting necklace, ” Bond said through now clenched teeth, the easy smile replaced by a hard stare, studying her facial expression for clues. Was this a trap? It certainly couldn’t be a coincidence that this woman was wearing the same necklace that was given to Vesper by the Algerian who seduced her… The same necklace worn by Corrine, the Canadian agent the Algerian was seducing when Bond caught up to him in Russia… And now on this woman broken down at the side of the road. 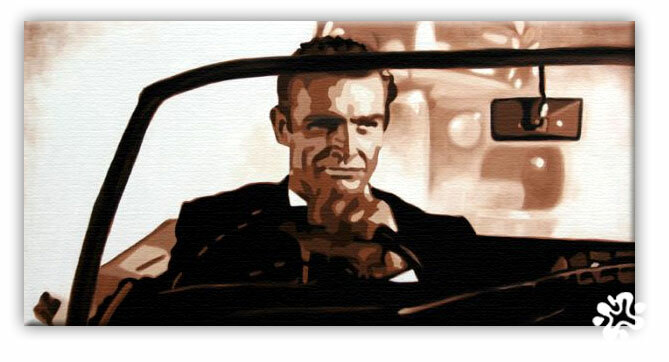 Bond began reaching for his Walther, but stopped short of drawing it as a Mercedes slowly pulled over behind. A well-dressed and somewhat frantic looking man stepped out and clumsily hurried over. His hands were in plain sight and he didn’t seem to be hiding any weapons. “Are you alright Penelope?” he asked the girl, his eyes moving from her to study Bond. “I’m fine Simon, this man was kind enough to stop and offer me assistance” she gestured towards Bond. Simon was handsome, though somewhat awkward. He stuck his hand out to shake Bond’s hand, mumbling some thanks. Bond shook his hand firmly, than tightened the grip. He then slid his thumb over the base knuckle of Simon’s thumb, forming a painful finger bar. The slightest added pressure will easily snap the thumb. Simon’s eyes were darting back and forth between his painful thumb and the piercing eyes of the stranger who was inflicting that pain. He was mumbling and whimpering and clearly on the verge of panic. “Ummm… errr.. Yyyes….” He finally stuttered. “Where did you get it?” Bond demanded, releasing the pressure on Simon’s thumb just a little, as a reward for his cooperation. Simon, visibly shaken, looked helplessly at Penelope and shrieked “Who IS this mental person?” Penelope, now terrified too, was looking at Bond wide-eyed and speechless. Still squeezing the man’s thumb with his right hand, Bond now grabbed Simon’s throat with his left hand and began to squeeze his Adam’s apple, never releasing his gaze. Satisfied that this man was obviously not a professional, Bond released his grip, and followed Simon to the Mercedes. Simon slowly opened the door and, under Bond’s watchful eye, reached for a Dunhill briefcase that was on the passenger seat. “Open it slowly” Bond ordered. He turned the catalog over, and there it was, on the back cover. Bond stared at the page for another moment, then at Simon with a bewildered look that almost seemed apologetic. Could it really be? Could the “Algerian Love Knot” be just a cheap prop from a mail order catalog? Bond turned started walking back towards his car. Bond turned and continued to his Aston Martin, not even stopping or saying a word as he handed the woman a his Universal Exports business card.